> Amber - Silver>Amber - silver pendant "Yakata"
Amber - silver pendant "Yakata"
A pendant in which the silver glow and an intensity of brownish amber contrast. A unique shape and an interesting silver framing. 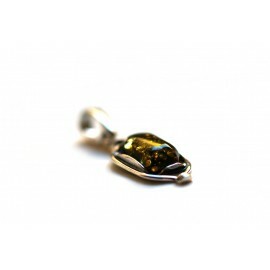 In a beautiful silver ornament there is an angular dark cognac color amber made to sleep. Originally consistent silver and amber forms as if remind of a Japanese boat - yakata.